As on my experience, I confirm below paragraph is 100% correct because this was the process exactly happened to me. Honestly, I just know only the fact exiting Israel is more difficult than entering when I was already on my Day-2 inside Israel. In this regard, the impact given by the immigration officers on arrival has not been diminished and the worry has been striking in my mind constantly .Though I have nothing to hide, reading about other experience especially by western travelers made me more to be on-guard at all times with my stuff and the way I respond to their interrogation. Despite the strict security, I still continue how I perform my usual travel style like walking alone off the streets, bringing my tripod everyday and going home at night by just walking only. Ben Gurion airport prides itself in being one of the most secure in the world. It achieves this through a number of means. On joining the queue for this security check, a security official will ask you several questions. Based on these (and what appears to be racial profiling) and a brief inspection of your passport, you will be assigned a number from 1 to 6. 1 signifies the lowest security concern and 6 the highest. Foreigners will typically get between a 3 and a 6. Age, appearance, stamps from Arab countries, evidence of visits to the Palestinian territory and other vague factors will be taken into account. Depending on the number you get (stuck on your passport and luggage), the security check is more or less thorough. Travelers who have visited the Palestinian territory will almost certainly receive a 5 or 6 (but this is not exclusive to this cohort; you can get 5 if you have never been to Israel before, and are of European descent). With a 5 or a 6, you can expect every single item of luggage to be taken from your bag and inspected in detail. Security officials have been known to check individual bank-notes. With a 6 (but sometimes even 5 if they have time), you can also expect to be taken to a cubicle and asked to remove your belt, shoes and have a personal inspection. If your clothes contain any metal that would set off a detector (such as studs in your jeans or a zip) even if plainly visible on the outside, you will be asked to remove the item of clothing. I woke up 0255H and had a 2 bottles of beers night before to celebrate my last night, appreciate and mesmerized the more than a week stay. Meeting point of transporation to Ben Gurion Airport is around 300m away only from my hostel. My dilemma on this day all started when Nesher taxi (remember the name but mostly recommended) did not arrived on agreed time of 0345H, what a drag to start the early morning. I immediately waved all taxi's passed-by. After couple of negotiations my fare going to Ben Gurion Airport from Jerusalem was 200 shekels ($57), lot of wasted money compared to 64 shekels shared taxi of Nesher taxi if only they arrived. I paid the taxi driver $50 (175 shekels) + 70 shekels = 245 shekels ($70) at 45 shekels tip. Initial charges by other cab driver costs around 280-300 shekels. This was the stage where a roaming passport control officer asked the same set of interrogation during arrival while scanning my passport. After the series of questions, she put 2 yellow bar coded stickers on my passport and my handcarry backpack. Put my stuff on usual xray conveyor then lined up again for manual baggage inspection. On this stage airport officer inspected my backpack thoroughly. 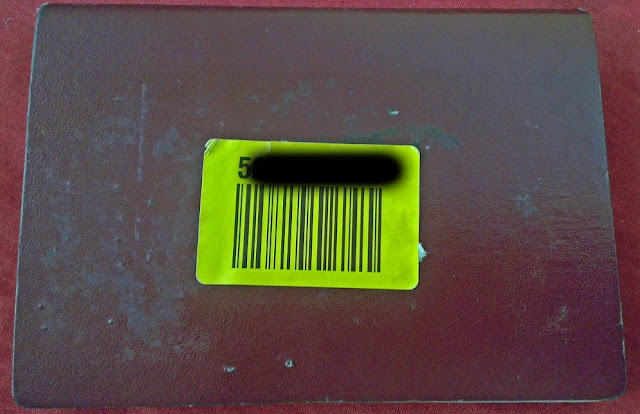 As per above paragraph, this barcode determines the level of alertness based on how the 1st interrogation went through. The level is from 'not suspicious at all' to 'highly suspicious'. Of course, I don't know what level I was categorized. Same with others I saw, my things where totally unpacked and wipe by their electronic detector (swabber). This detector is color light blue green, detection head has a hole in the middle with with filter paper and look like a long big spoon. After couple of minutes, computer has no indication of suspicion. I packed again my things and then the young inspector escorted me to the airline check-in counter where I was assigned. After around 3 minutes the checker handed over my boarding pass. The bag inspector who escorted me was surprised that I just hand-carry my backpack. He said the manual inspection he performed was for check-in luggage only. Xray machine again + removing my jacket & all things inside my pocket. After x-ray as usual, mandatory thorough swiping and unpacking. Inspectors were much more strict on handcarry bag as they were totally swiping every things I have, I'm just standing and watching them. On the area of my souvenirs I bought from Europe (my port of entry was Rome), the detector alarmed (sounds like longer buzz compared to the open metal detector). I feel very uncomfortable that moment. They called their Supervisor and interrogated me again. This time he asked detailed questions like what really my work is, explained my functions and what countries I had visited before coming to Israel. I showed my company ID as he requested to confirm my explanation. According to him, my stuff has 'indication' (just that nothing else) then interrogation continued. I don't know what this means (whether gunpowder particles, fingerprint of others, or any kind of CSI analysis-type). They rechecked again everything from the start and more thoroughly. In addition, they requested me to come on a private cubicle for rigid body inspection. They told me to remove my shoes and unbutton the top part of my pants. The inspector performed manual and electronic inspection on my whole body (up and down for twice). After a couple of minutes, I seated back outside and have been told I'm negative but my backpack has to be checked-in. Good thing somehow NOTHING was confiscated/thrashed on my things, I brought everything I had. He handed over my passport and gave signal ready to go. By the way, there were 5 officers entertained me on this stage (3 regular inspectors, 1 senior inspector and 1 supervisor), lasted for an hour and no any single word of explanation why the detector alarmed on my stuff. The officer asked again the same set of questions but this time, interrogation was very short. The officer gave me exit permit in exchange of stay permit issued on my arrival. In a matter of less than 5minutes, I'm already looking towards the boarding gate hallway. I went immediately to toilet, relax myself and look to the mirror on an empty mind, then look for vacant seat outside. I'm still in shocked knowing my future is in the mercy of this passport control officers. Boarding started at 0720H. Predicament did not stopped here. When I arrived on my destination (Muslim dominated country in Middle East), my coin purse slipped-out in the pocket of my backpack, which contains mini flash drive, small amount of cash and the most important, the apartment keys. Due to panic to run the boarding gate and the effect of very rigid swabbing, I forgot to check this very important items. What a graceful exit to complete my 31-days vacation leave from Central Europe to Israel. My work and residence is based in Middle East. It is very advantageous that my passport has lots of visa stamps. It is on a very high possibility that Immigration Officer inbound to Middle East country will not inquire my country of origin. I forgot my valid Schengen Visa was multiple entry. Instead of going to Istanbul, I could go back to any European countries and stay there a little while then fly back.